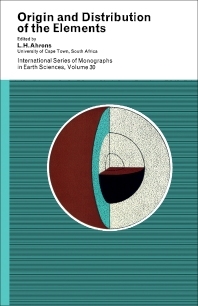 Origin and Distribution of the Elements, Volume 30 presents detailed studies of trace elements and isotopes and the use of these data with the techniques of physical and organic chemistry to make relevant interpretations in geology. This book discusses some of the problems of applied chemistry. Organized into five sections encompassing 89 chapters, this volume begins with an overview of the theories of nucleosynthesis that are based on broad empirical foundations involving experiment in nuclear physics and observation in geophysics and astronomy. This text then explores the primeval abundance of the elements wherein the composition of the material from which the Galaxy is formed. Other chapters consider the production of helium in the galaxy. This book discusses as well the dynamics of the cores of highly evolved massive stars. The final chapter deals with the measurements of site populations in crystal structures by electron diffraction and X-ray. Physicists, astronomers, geologists, and geochemists will find this book extremely useful. Magmatic differentiation and autometasomatism in a zoned granitic batholith from central Texas, U.S.A.